Rugged, solid-surfacing material stands up to demanding public restroom conditions. However, the solid-surface sink system to specify depends on restroom traffic, typical visitor profile, and likelihood of vandalism. 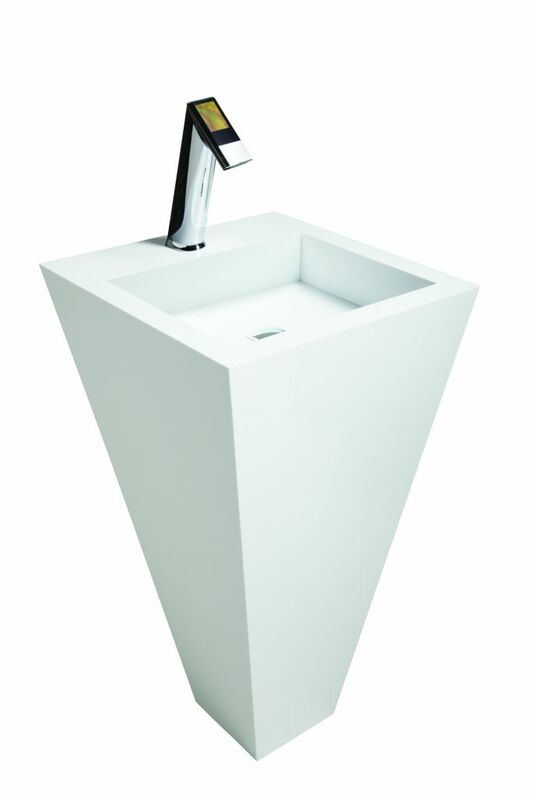 A stylish, free-standing sink, such as this one with a square basin, is suitable for hospitality suites and other light commercial applications requiring high design. Where the real differences enter the picture for commercial restroom specifiers, is in determining which sink system with solid surfacing is best for each application. 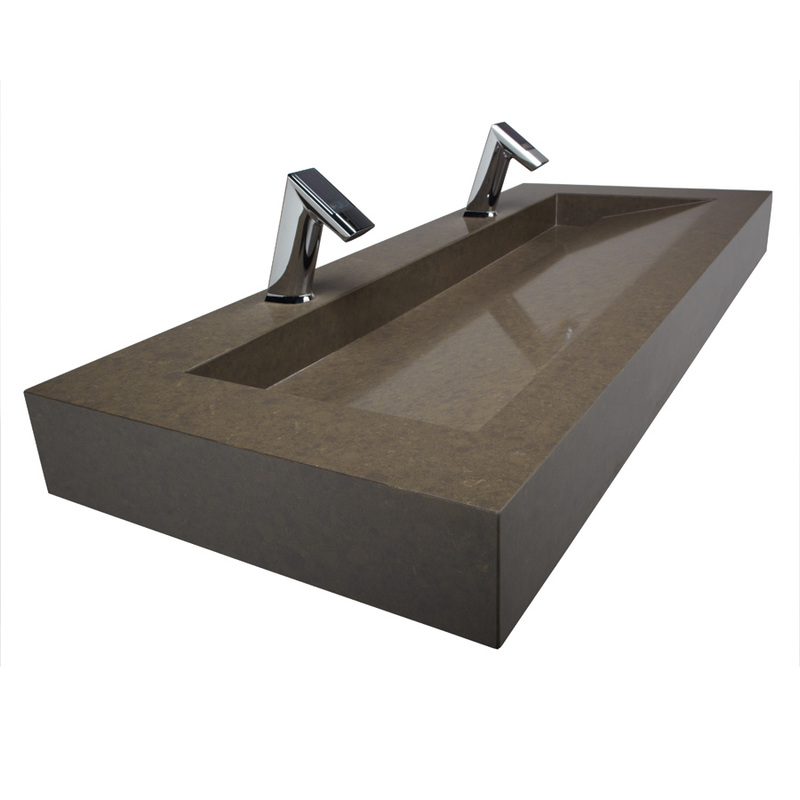 The sink styles and individual features vary greatly. Different restrooms call for different sink configurations, and specifiers have many styles from which to choose. Sink systems are wall-mounted, installed on the floor with a pedestal, or are part of a floor-mounted cabinet. If a restroom has adequate structural support in or behind the wall, sinks may be installed onto the wall using mounting fasteners or brackets. These can either be countertop-only models, which expose the basin’s underside and other plumbing components, or be incorporated into a complete cabinet to hide these components for security, safety, or esthetics. Pedestal sinks, and other styles of vanities resting on the floor, are good for commercial restrooms. 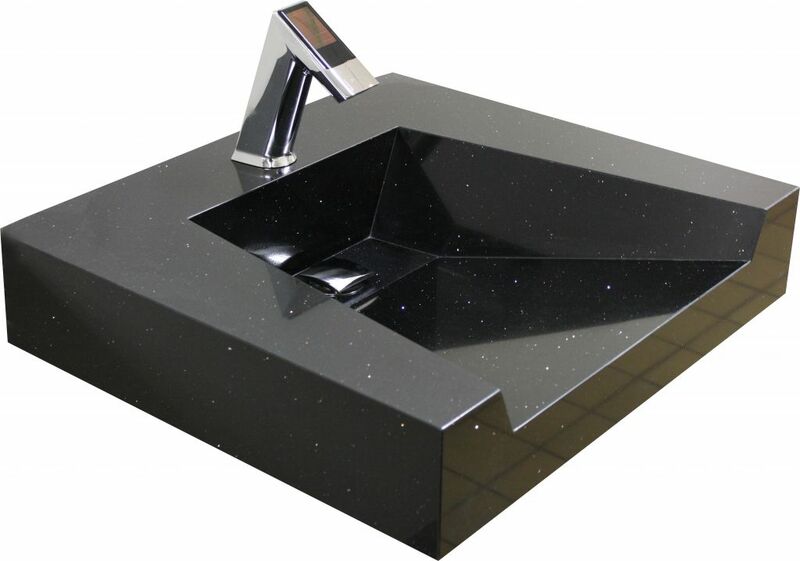 Decorative pedestal sinks, similar to the types used in residential projects, are available for light commercial applications where appearances are particularly important, such as hotels, restaurants, and executive office restrooms. Rugged, floor-mount sink systems can include electronic water fountains with multiple spouts, which are popular in high-use environments such as stadiums or airports. An advantage of a pedestal or free-standing fountain model is they fit in corners and other odd spaces. Sinks come in single-, double-, triple- or quadruple-station configurations. Of course, the more sink stations, the higher the price. However, specifiers need to project the number of restroom users and the traffic flow for each project. Not having enough stations in a busy restroom leads to line-ups, which can frustrate visitors. A front-to-back pitch on this open front sink system keeps water in check, yet is best suited for applications where users are not prone to mischief. 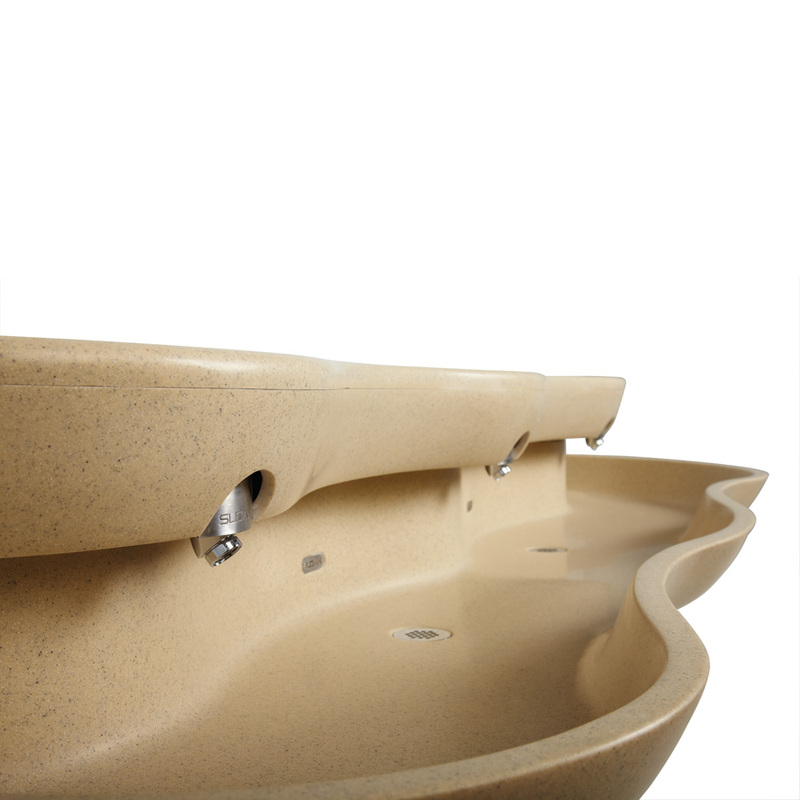 Solid-surface sinks are made from a single, moulded piece, which may or may not include the basin. If the design incorporates a separate sink bowl, it is either an undermount or drop-in model constructed of porcelain, or solid-surface material. Both undermount and drop-in bowls are suitable for commercial applications. Specifiers often prefer undermount models because they are flush with the countertop surface. Undermount bowls are easier to clean than rimmed sinks and do not require visible caulking on the countertop that can wear away over time, look unappealing, and require owner maintenance. Although stainless-steel construction is the mainstay of healthcare and foodservice applications for sanitary reasons, solid-surface basins or porcelain bowls are preferable for public restrooms because they hold up to constant use and do not scratch as easily as stainless steel. Solid-surface sink countertops are typically flat. However, some models have surfaces slightly pitched toward the drain or basin to keep water from pooling on the countertop. Integrated solid-surface basins, which have traditionally been square or round, also now come in pitched styles—higher in the front, lower in the back, and with or without a rim—that lead to linear drains. Again, the suitability of these various styles depends on the application. For example, in an elementary school countertops that are pitched from the sides toward the drain may be specified because children are more likely to splash water, which would cause water to pool. 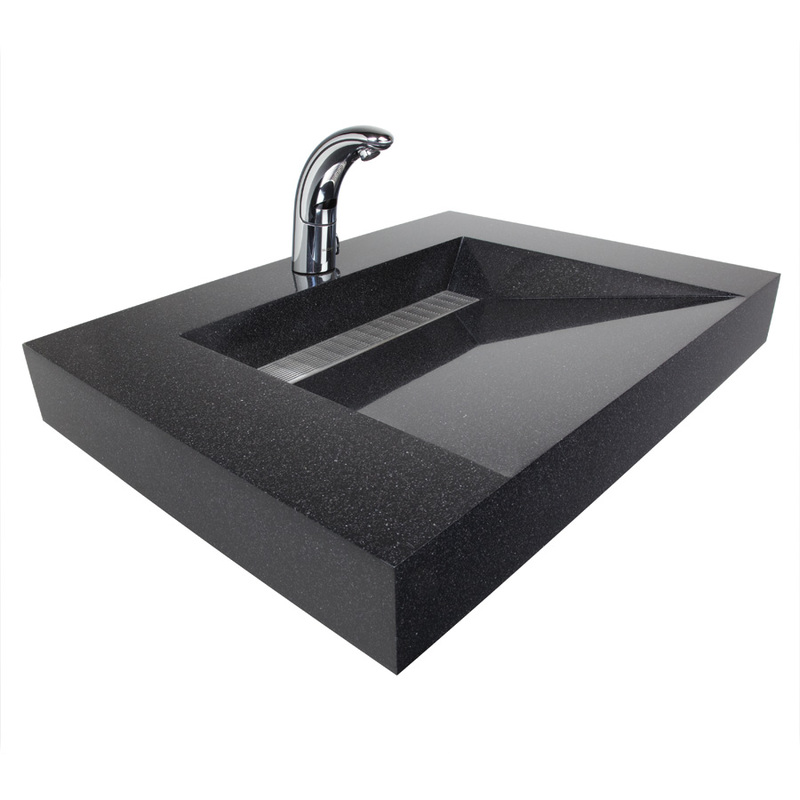 Sinks may have gradient styling while retaining the rim typically found on commercial sink systems. An installation hindrance with wall-mounted cabinet-style lavatories is they are often heavy and cumbersome, making it necessary to have more than one person carry and hold the unit in place as it is attached to the wall. Lavatories vary in weight and style, so specifying a lighter model may be necessary. Units shipped pre-plumbed also simplify installation and remove the guesswork of which solenoid goes to which aerator, or which control box supports which faucet sensor package. As for ongoing service needs, sink systems provide either above- or below-deck access to serviceable components. Unless below-deck components are exposed, access would require removing the lavatory’s front panels, which can be heavy and may require two people. Further, maintenance on models with below-deck components means service professionals must do the work on their backs or knees. Lavatories with serviceable above-deck components—such as the water shut-off valve, electronics, and soap dispenser—usually have a top-latched lid that can be locked, yet easily removed with the appropriate tool. Solid-surfacing materials are easily maintained. Mild abrasive cleaners are usually sufficient for everyday cleaning, and scouring pads can help remove tougher stains. This type of open front sink system uses a contemporary linear drain design instead of a traditional round drain. The public can be hard on plumbing systems. Vandal-proof or resistant lavatories are necessary for school restrooms, and for any restroom serving the general public. High restroom use alone can strain lavatories. When restrooms welcome a high number of visitors, it becomes critical to find sink systems specifically designed for applications such as retail shopping centres, transit stations, and sports arenas. 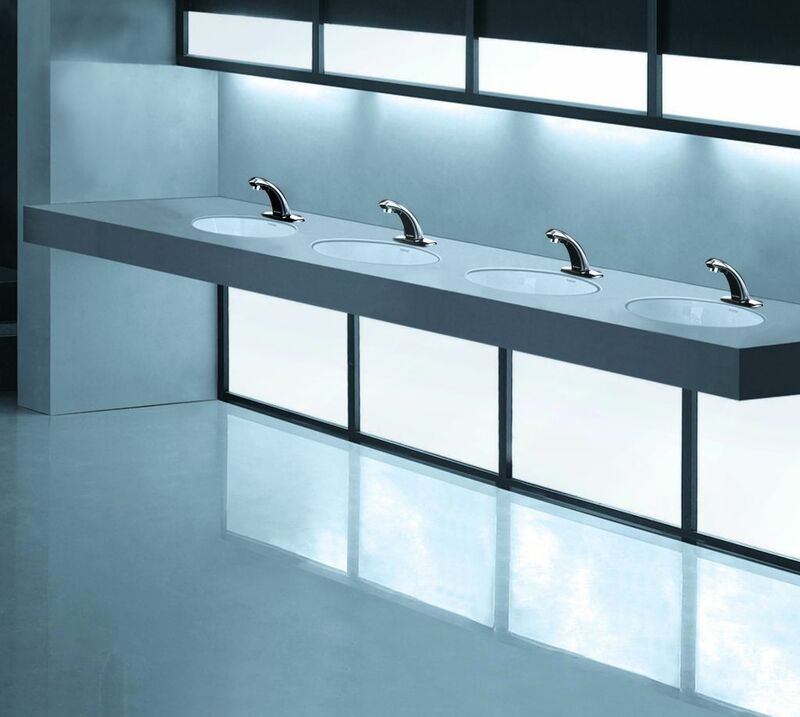 Although all-porcelain sinks are acceptable for light commercial applications, they are usually not tough or large enough to withstand heavier public restroom use as they chip and crack more easily than other materials. Specifiers should evaluate each facility to determine which lavatory sink styles and features are best intended to serve certain groups of restroom users, while minimizing damage and maximizing lavatory longevity. A restroom in a facility with low potential for misuse, such as a library or an office building, can opt for a lavatory with exposed components. A designer working on a restroom in a stadium, entertainment centre, or other facility serving users with high potential for misuse should specify complete sink cabinet systems to safely house all components, or at least install locked boxes over valves and faucet battery packs. There should also be no visible fasteners or obvious access points, which could invite unwelcome access. 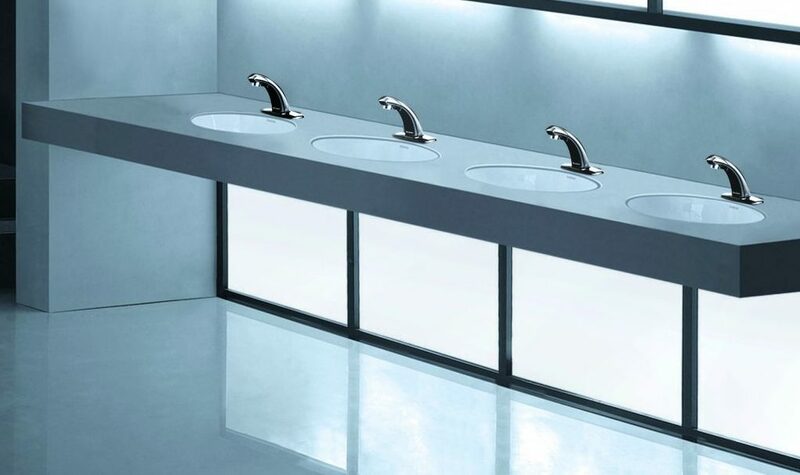 The major benefit of specifying solid-surface sinks for public restrooms is they are usually resistant to stains, chemicals, impact, and scratching. It is just as important, however, to ensure the sink system support structure is ruggedly built to perform under demanding conditions. Stainless-steel structures are the most solidly engineered styles. Integrated spouts, which are an alternative to regular faucets, are less prone to vandalism. Sink systems giving above-deck access to components, make it easier for maintenance personnel to reach and service units. The risk of vandalism should also be considered when specifying a faucet type to match a lavatory. Depending on the lavatory style, sink systems can be paired with deck- or wall-mount faucets, or with spouts. Water spouts are usually the most vandal-proof option, given their low profile and hands-free operation. Faucet styles vary widely in the type of spout, height, and water stream. Low-profile faucets tend to hold up to high use better than taller faucets. Sensor faucets or spouts are not only the preferred option for commercial restrooms where convenience and appearances matter, but are also often the best choice for restrooms with high-abuse potential. This is because they are operated touch-free. For instance, blade or cross handles on a manual faucet can break with repeated rough use, as can the push buttons on metering faucets, which users sometimes pound on to run the water. Gooseneck, wall-mount, and taller deck-mount faucets are good choices for restrooms used by facility employees or other patrons who will treat fittings responsibly. Although some sensor-activated faucets are too delicate for heavy commercial use, there are numerous low-profile, solid-body models better suited for these applications, and their touchfree operation reduces the likelihood of hands-on damage. Sensor activation also keeps restroom visitors from using water unnecessarily and minimizes the possibility of sink overflows. Intentional or unintentional sink overflows, caused by debris collection or other factors, can lead to housekeeping nightmares and water damage. Besides faucet type, another way to avoid the problem is by specifying a sink with a single grid strainer leading to two separate waste lines, which will reduce backups from a clogged pipe. Also, when sinks have overflows for each supply (e.g. two for a two-station, three for a three-station) they are better equipped to handle runoff. Wall-mount sink systems are suitable for wheelchair users or children when mounted at the appropriate height and when the distance to the faucets is within reach for these restroom visitors. 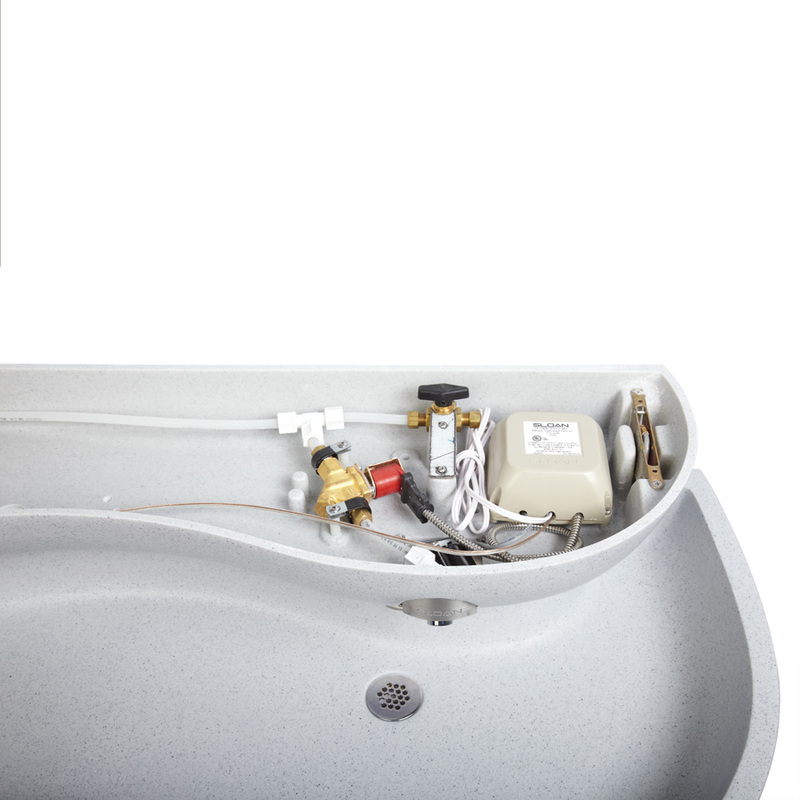 Accessibility is a key issue to consider in specifying a sink system. Wall-mounted sink systems are often specified because wheelchairs can slide beneath them.1 Floor-mounted cabinets can be suitable for wheelchair users if they are contoured to provide enough clearance to allow wheelchair users to get close to the sink. Applicable plumbing codes to ensure sinks are mounted at the right height and with a suitable reach distance to the faucet for disabled users should be consulted. 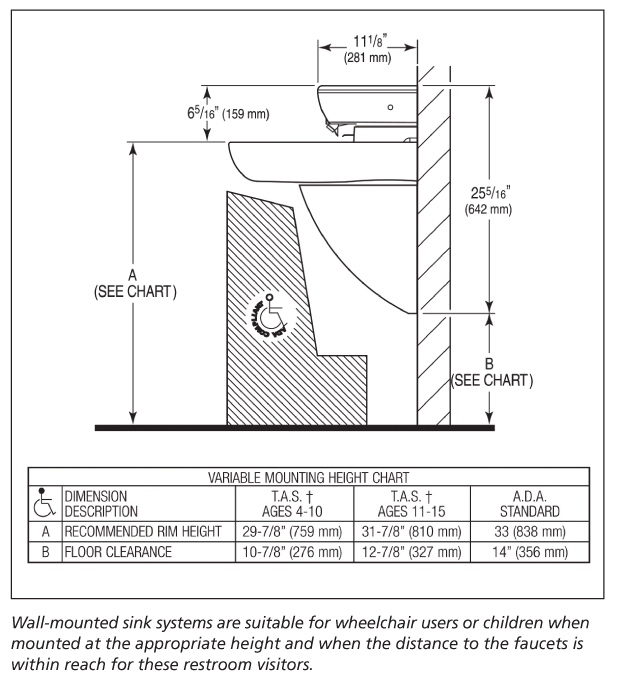 According to the Canadian Standards Association (CSA)B651, Accessible Design for the Built Environment, sink rim height for disabled users should be at 810 to 860 mm (31 to 33 in.) from the floor. For example, Ontario Building Code (OBC) specifies the top measure to be no more than 840 mm (33 in.). This also holds true for restrooms predominantly used by children. Special juvenile-height cabinets are an option for elementary schools, daycare centres, museums, and other child-centric facilities. Or, installers can mount regular sink systems below standard heights. Whether restrooms will be used by a certain segment of visitors, or by a mix of users of all heights and abilities, it is wise to consider which features and sink styles will be most appropriate, functional, and easiest to service in each environment. 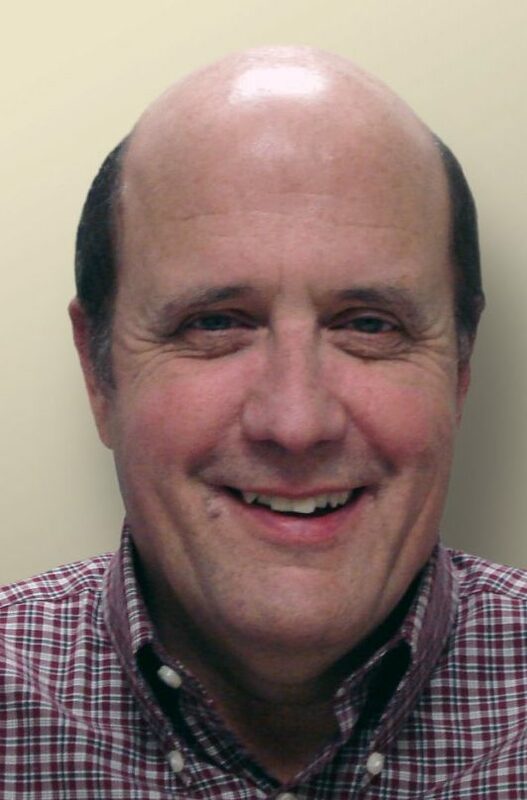 Steve Connaughton is the sink system and programmed water technologies (PWT) product line manager for Sloan Valve Company. 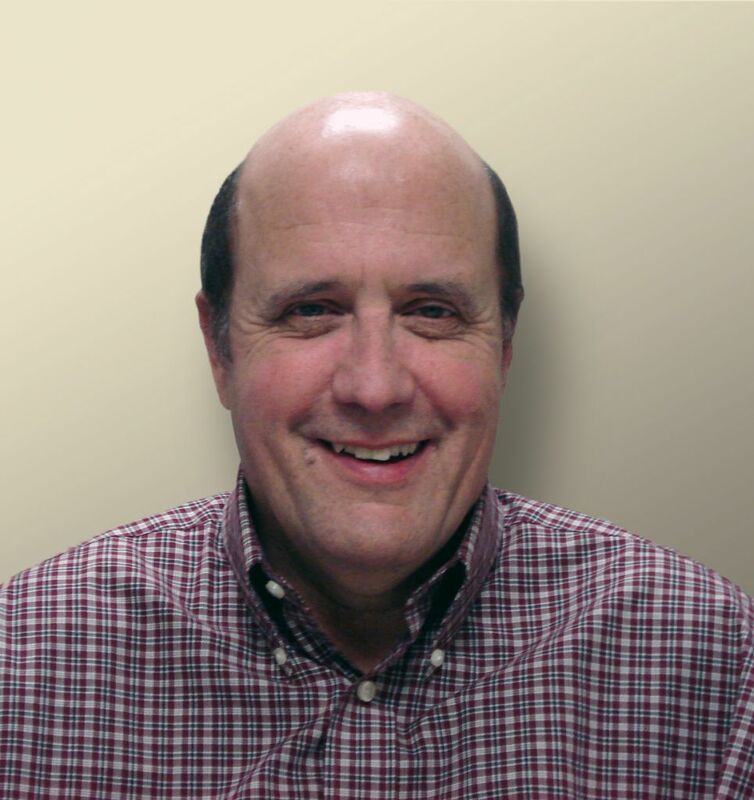 For more than 30 years he has worked in numerous sales and management capacities for Sloan. Connaughton can be reached at steve.connaughton@sloanvalve.com.